EMSB 2016-2017 FINANCIAL STATEMENTS: The 2016-2017 audited financial statements were deposited at the October 25 Council meeting. Due to the continued growth in the Vocational Sector, the operating surplus for 2016-2017 is $13.9 million. Council is pleased to be able to use over $7 million from the June 30, 2017 accumulated surplus in 2018-2019 for continued services to directly benefit our students and investing in improving our schools and centres. This is in addition to the $5 million that was appropriated in the current fiscal year. Coordinator of Homeschooling for Educational and Technology Services...Magdalena Sokol is now the interim Coordinator of Legal Services, working under Lucie Roy, the interim Legal Counsel. SCHOOL CALENDARS: The 2018-2019 youth sector calendar has been posted. You can see it here. Our Principals gather in the EMSB Administration Building atrium. NATIONAL PRINCIPALS MONTH: Great principals make great schools and can have a profound impact on a school’s students, teachers and the community as a whole. The Learning Partnership is proud to celebrate once again celebrate the dedication of principals this October for National Principals’ Month. We announced October as National Principals’ Month in Canada last year to recognize and raise awareness about the vital role of principals in public schools and communities across Canada. You can also nominate a principal to be honoured as one of Canada’s Outstanding Principals, the only nationally recognized award and executive leadership training program for principals in Canada. In October, the EMSB Regional Directors held a small reception with their principals to thank them for the great work they do. For more information log on to :http://www.thelearningpartnership.ca/news/october-is-national-principals-month. Phillip E. Layton School teacher Francine Gravel. RETIREES DINNER: About 130 people attended the annual retirees' dinner, which took place on October 17 at the Plaza Volare Reception Hall, which is located at the Crowne Plaza Hotel in St. Laurent. The evening honoured 96 retiring employees of the EMSB who worked as educators, administrators, professionals and support staff, and who’s combined years of service to the Board added up to 2,087 years. EMSB Chair Angela Mancini, along with Vice-Chair Sylvia Lo Bianco, Deputy Director General (Administration Division) Benoit Duheme, several EMSB Commissioners, and senior administrators from Education Division East, Education Division West, Adult Education and Vocational Services, Education & Technology Services, Material Resources, Student Services and School Organization, presented each retiree with a special thank-you gift of a Hillcrest crystalline pitcher. Some of the longest serving employees honoured that evening were former Material Resources secretary Carol Walters, who retired after 47 years of service to the board; Nicole Rabeau, who retired as a teacher at Nesbitt School in Rosemount after 42 years of service; Geoffrey Saunders, who retired as a teacher at Programme Mile End School after 38 years of service; and Gilles Boudreau, who retired as an analyst from Education & Technology Services after 34 years of service. CTV COMMERCIALS: The EMSB has unveiled its new commercials set to run on CTV this September and October to promote open house season. It features Chairman Angela Mancini and six students. You can see the commercial here. OPEN HOUSE: The EMSB has enhanced its Open Houses website (www.emsbopenhouses.com . Please check it out. 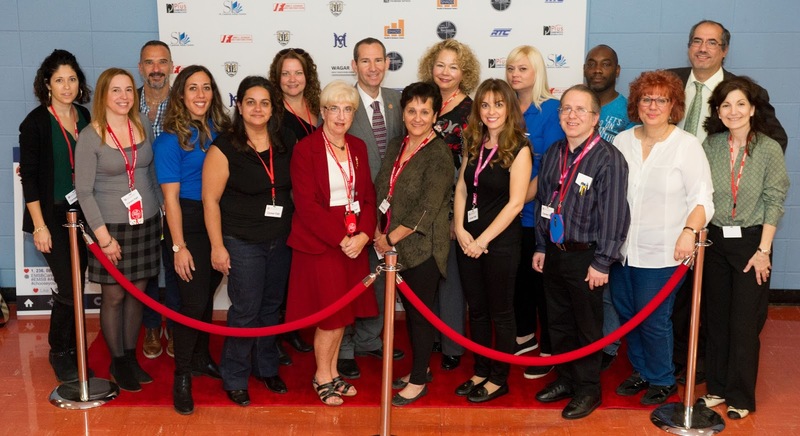 EMSB EXPRESS: The fall edition of the EMSB Express has been published. Inside you will find special four page sections on our new Nutrition Program, entitled Eat, Grow, Learn and a recap of our 2017 Volunteer Appreciation Evening with lots of photos. At 20 pages this is our largest edition ever. Mauro Biello (right) is greeted at Marymount. 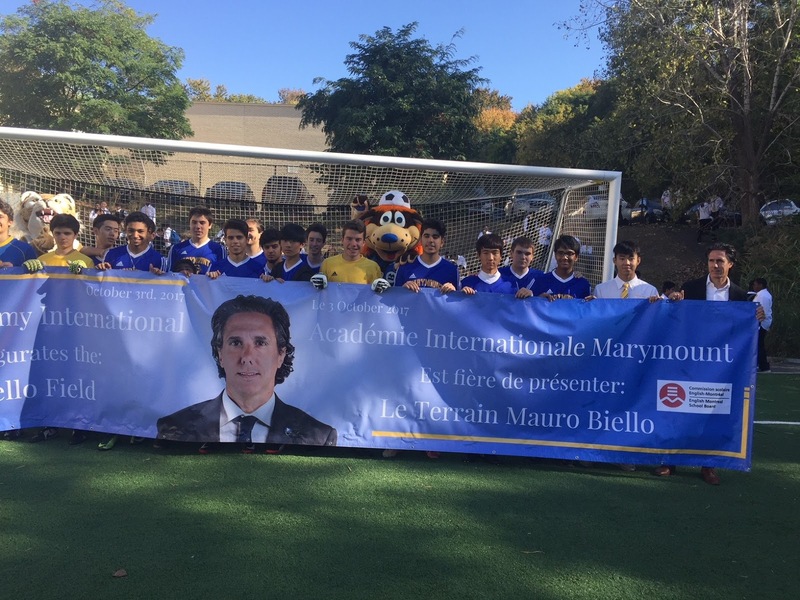 MAURO BIELLO FIELD: Marymount Academy International NDG formally inaugurated Mauro Biello Field on October 3, with the former student and ex-Montreal Impact soccer team head coach on hand for the ceremony. Biello attended Marymount from 1984 to 1989. Prior to that he was a student at St. Monica Elementary School. His children presently attend EMSB schools. Biello is in his second year as Impact head coach and director of player personnel after being appointed on November 11, 2015, after three months as interim head coach. He was in his eighth year with the Impact coaching staff, including four as assistant coach in Major League Soccer, following a 19-year professional playing career, including 16 seasons in Montreal. In 389 career games and 28,076 minutes played with the Montreal Impact, Biello registered 77 goals and 67 assists for 221 points (regular season, playoffs and championship games). He finished his career as the Impact’s all-time leader in games played, games started, minutes played, goals, assists, points, game-winning goals and shots on goal. “My favourite Marymount memory would be all the great friendships I made over the years and still have today,” he says. “Marymount was a platform for me to learn and grow, as a student and person, which has helped me in my career.” See the CTV report and this one on Breakfast TV. Lloyd Barker charmed the students and teachers at Roslyn. THE LLOYD BARKER TOUR: Former Montreal Impact team MVP, league All-Star and Assistant coach Lloyd Barker is available to visit schools as a motivational speaker. His talks are geared towards students aged eight and up. Lloyd's presentations combine motivational topics (perseverance, appreciation, life-lessons), with an emphasis on the importance of staying in school, as well as training and wellness tips. The duration is between 60 and 75 minutes, and includes an autograph session opportunity at the end. He suggests that schools combine the classes into one big group and assemble in the gymnasium for the presentation. Mornings are preferential. He was so well received at Roslyn Elementary School in Westmount on October 25, that they asked him to stay longer and do some soccer drills with a Grade 2 physical education class. It should be noted, Lloyd's presentation and format is similar to the one he spearheaded with the Montreal Impact when they launched their stay in school program back in 2006. He was the lead speaker for six years and it was an extremely well received program. There is no cost for Lloyd’s talk. He is asking that the school allows him to distribute flyers for his new soccer academy to students in attendance who might be interested. Lloyd's professional career began at the young age of 17 when he signed his first pro contract with the Ottawa Intrepid of the Canadian Soccer League (CSL). Along with playing for the Jamaican National Team, Lloyd also played 10 seasons with the Montreal Impact. Since then, he has been involved in the game at every level in North America and is now one of Canada's most respected soccer minds. Lloyd's extensive playing, coaching and broadcasting experience, has provided him with a high level of knowledge that is not matched by many in Canada. You can find out more about his academy at www.best11academy.com. Lloyd can be reached at lloydbarker11@yahoo.com. Students had many kiosks to visit at the Career Fair. 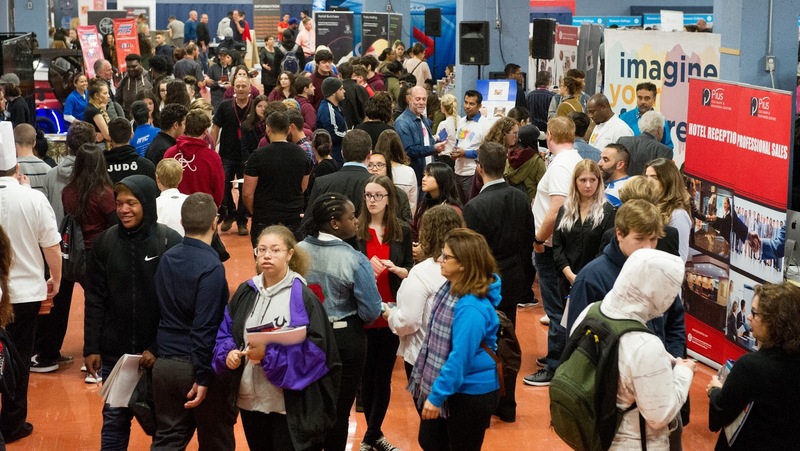 CAREER FAIR: More than 2,000 Secondary V students attended the 18th annual EMSB Career Fair on Wednesday, October 18 and Thursday, October 19 at St. Pius X Career Centre in Ahuntsic. Jack Dym of Pipe and Piling Supplies Ltd. and RBC Royal Bank were the event’s title sponsors. Several on air personalities from the media were on hand to talk to students about careers in this field and serve as guest emcees: Eramelinda Boquer of CJAD, Catherine Verdon Diamond of City’s Breakfast TV, Cousin Vinny and Nikki from The Beat 925 FM, Sarah Leavitt from CBC, Tim Sargeant from Global News and Christine Long from CTV. See the program book. Students gather at the Dawson College kiosk. Canadian professional basketball player Lizanne Murphy and four-time Canadian women’s hockey gold medalist Caroline Ouellette were on hand to meet with students. They are part of the RBC Olympian Program, wherein both Canadian Olympic and Paralympic athletes work as community ambassadors who bring Olympic messages of excellence and leadership to Canadian communities. The Career Fair organizing committee. On the Wednesday evening, the Career Fair was open to the community-at-large. This was a good opportunity for parents to attend with their children as they look towards post-secondary education options in a one-stop shopping experience and the turnout was huge! Harriet Cohen from EMSB Adult Education and Vocational Services is the Career Fair chairperson. The Student Services and AEVS Departments of the EMSB coordinate this program. Ms. Cohen notes that the main objective of the Career Fair is to provide students with an in-depth exposure to the various educational opportunities available to them. All students took part in a brief general information session in the St. Pius X auditorium. Students then had the chance to visit the various exhibition/information booths staffed by representatives from English vocational centres, CEGEPS, universities and some private business colleges. SPORTING EVENTS AND CARDIAC INCIDENTS: How Much Can Watching Hockey Stress Your Heart? Spectators experienced significantly elevated heart rates, equivalent to rates with vigorous exercise, while watching hockey games live or on TV, according to a new study in the Canadian Journal of Cardiology Sporting events often leave people on the edge of their seats, but what does all that excitement do to their hearts? A new study suggests that both the thrill of victory and the agony of defeat can have a substantial effect on the cardiovascular system. Investigators took the pulse of fans during a hockey game and found that on average, their heart rate increased by 75% when watching on TV, and by a whopping 110 percent (more than doubled, equivalent to the cardiac stress with vigorous exercise) when watching in person. Their findings, along with an accompanying editorial, are published in the Canadian Journal of Cardiology. Leia Khairy and Roxana Barin presenting their project at the Royal West Academy Sciencen Fair. 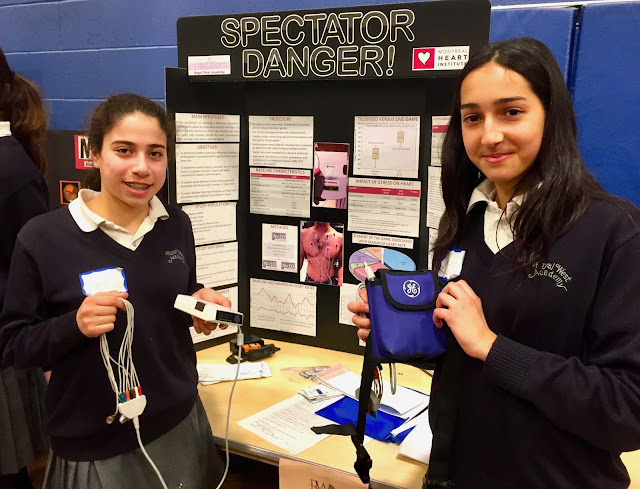 Armed with Holter monitors, a team of researchers set out to assess the effects of a Montreal Canadiens game on healthy spectators. While previous studies have indicated a link between sporting events and cardiac incidents, this is the first study to specifically focus on hockey. The average 75 percent increase in heart rate they found in TV viewers and the 110 percent bump from watching a game live are equivalent to the heart rate response that occurs with moderate and vigorous physical stress, respectively. Overall, the heart rate increased by a median of 92 percent (almost doubled) across all spectators. EMSB STUDENT ON LA VOIX JUNIOR: Chelsea Goldwater, a Secondary I student at Royal West Academy , made it past the blind audition stage on TVA’s hit show La Voix Junior, singing Part of Your World before an estimated TV audience of close to three million viewers. After passing through the first two audition processes, competing against several thousand other young singers, she advanced to the prestigious blind audition stage. This is when in order to proceed to the dual rounds, at least one of the coaches (judges) must turn their chair around. Singing the song Part of Your World, she succeeded in having Marie-Mai and Alex Nevsky swing her way before a television audience of close to three million viewers. Chelsea’s sister Kailey, 14, dad Ira and mom were behind the stage for the blind audition and shown frequently on TV. The clip is now getting a lot of hits on YouTube. Chelsea will next appear in the dual rounds on Sunday, November 5 at 7 pm on TVA. To see her performance click here. TRUDEAU MUSIC: Pierre Elliott Trudeau Elementary School music teacher Caroline Cameron has been active with her students on a project called “Une chanson à l’école” for which Les Soeurs Boulay composed a song called “De la terre jusqu’au Courant.” The video of the performance is on the PET Facebook Page and on the Facebook Page of "Une chanson à l'école" (along with other schools that posted their videos on that page). Over 600 schools participated, but les Soeurs Boulay only went to sing in two schools with the students, PET being one of them, Watch this beautiful report which aired on Radio Canada and showcased the students’ beautiful French: There was also a this "photo reportage" in La Presse (in la Presse plus). Watch this fabulous link of Les Soeurs Boulay singing with our students. Ms Cameron is working with Michel Pagliaro, Élage Diouf and Crystal Shawanda. CAMPING EXPERIENCE: Students from Vincent Massey Collegiate in Rosemount and John F. Kennedy High School in St. Michel welcomed fall with an overnight camping experience at YMCA Camp Kanawana. Eleven students from École Secondaire Louis Joseph Papineau’s class d’accueil joined them as well. The students spent two days in the shadow of Mont Saint Sauveur, canoeing in its lakes and hiking in its natural green spaces. The youth learned about modern conservation, nature, and participating in team building activities. “Allowing youth from different and diverse backgrounds and cultures, to experience being in the great outdoors and to be part of nature is a wonderful, nurturing and unique experience that really allows them to be part of something spiritual and profound,” said Spiritual and Community Animator Rocco Speranza. Students enjoy their camping experience. Students took time to work in groups and plan community based conservation action projects that will be implemented over the year. The camping trip permitted the students to strengthen existing friends while creating new ones, learn about other cultures, share ideas and work on projects aimed at appreciating and conserving nature. A special thank you to the staff from both schools as well as Spiritual and Community Animator Samantha Smith. MUSICAL PROJECT: A total of 230 students from the EMSB will take part in this year’s exciting project, recounting the classic Greek story, l’histoire du roi Midas on Thursday, October 26 (7 pm) at the Centre de congrès Palace (1717 Boulevard Le Corbusier) in Laval. This follows up a wonderful experience last year via Le Temps des Flours, le Temps des Neiges, a massive multidisciplinary project that like this culminated in the creation of a book/CD for children in French. The EMSB will be represented by nine elementary schools: Gardenview and Cedarcrest n St. Laurent, Pierre de Coubertin and Honoré-Mercier in St. Léonard, Edinburgh in Montreal West, Roslyn in Westmount, Royal Vale and Willingdon in NDG and Sinclair Laird in Park Extension. 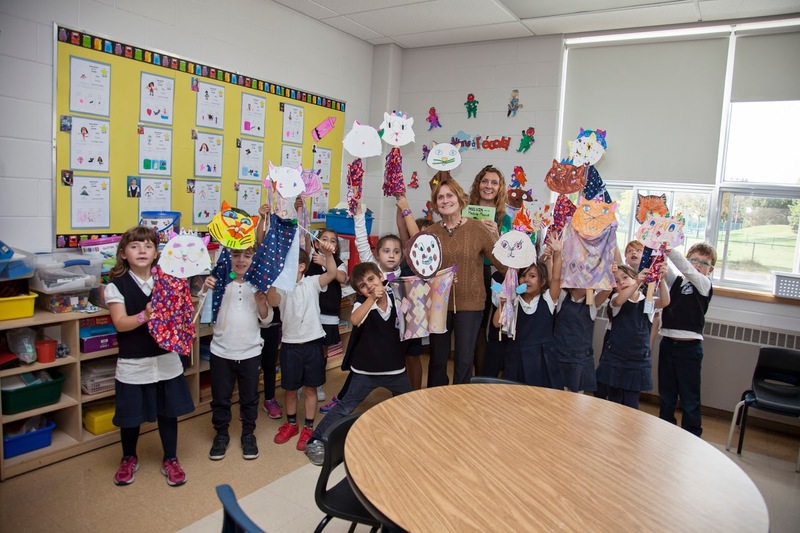 “Staff, students and parents have been very devoted towards this project and I am very happy that the majority of the choristers come from our school board,” said EMSB Chairman Angela Mancini. See the full press release. MEDIA LITERACY WEEK: Media Literacy week of 2017 will take place November 6 to 10 (https://www.medialiteracyweek.ca). The official theme is Inclusion in a Connected World: A Place and a Voice for Everyone. Through the theme the EMSB will promote ways that diverse voices, perspectives and talents can participate in and enrich our media and digital spaces. A number of events are planned, including the return visit of journalist Arpon Basu to his former elementary school, Edinburgh in Montreal West. Arpon is the editor-in-chief of The Athletic Montréal and Athlétique Montréal. Previously he worked for the NHL for six years as Managing Editor of LNH.com and a contributing writer on NHL.com. He began covering sports in Montréal, with a heavy emphasis on hockey, in 2000. Nadia Barrafato at East Hill Elementary School in RDP is rolling out a comprehensive program on Media Awareness, Internet Safety and Cyberbullying in Grades 3 to 6. At the Grade 5 level students will learn about the topic, form groups and create a "video game" company in which they must create an Internet Safety and Cyber bullying game for Grade 3 students to play using scratch. In Grade 6, students are now learning...What is Media? What are the different forms of Media? They are also reading a case study which looks at the life of a student in the 1950s and comparing it to the Life of Students in 2017. Students learn about the world of advertising and the techniques of persuasion used by marketing companies. Later in the year, students will be creating billboard ads, magazine covers, forming companies and inventing products. Other teachers focusing on the theme will be Carolyn Liverman at Parkdale Elementary School in St. Laurent, Jennifer Harriet from FACE School downtown and Aaron Proeser at Royal Vale Elementary School in NDG. Students have a blast with Lydia Lukidis. FREE LITERACY WORKSHOP: Published author Lydia Lukidis offered a free literacy workshop to the students in Grade 1 at Dunrae Gardens Elementary School in TMR on September 29. The students were treated to a reading by the author, as well as a puppet making workshop. Each student got to create their own unique puppet and learned to basics of manipulation and character development. The workshop was given in the context of the festival Les Journées de la culture, which hosts hundreds of free cultural activities every year. For more information on Lydia Lukidis go to: http://www.lydialukidis.com. For more information on the festival: http://www.journeesdelaculture.qc.ca. SINCLAIR LAIRD TURNS 60: Sinclair Laird Elementary School in Park Extension brought families on a trip down memory lane on October 5 as they celebrated their 60th anniversary. The event launched 60 days of celebrations that will culminate with the school’s Christmas concert on December 21 (12:30 pm). On hand on Thursday to begin the school’s 60th anniversary celebrations were current and former students, staff as well as members of the community. Memories were shared via speeches, musical performances, as well as audio/visual displays. SOLIDARITY WITH LAS VEGAS: In light of the senseless act of violence killing at least 59 people, including four Canadians, and seriously wounding hundreds of other in Las Vegas, students and staff members from Rosemount High School and Nesbitt Elementary School in Rosemount, Perspectives I & II in St. Michel and Dalkeith Elementary in Anjou will be honouring the victims of through a book of peace and empathy entitled “Step Back. Move Forward.” The book will be spearheaded by Vince Lacroce, Spiritual and Community Animator. Students will be writing poems, personal messages of hope, as well as creating artistic representations of peace marking this tragedy. The book will be bound and donated to Las Vegas City Hall as a sign of solidarity and support for the families struggling with the aftermath of this tragedy. Jeanine Lason, Natasha Gillespie and Marjie Bober from LaurenHill Academy for organizing such a successful event. 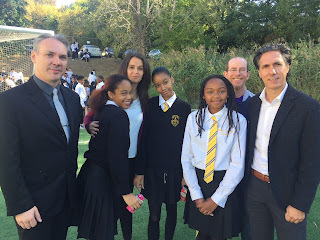 They also thank Marymount Academy's Leadership Program and their Advisor, Mr. Bunn for helping make the experience fun, as well as Principal Fequet for letting us borrow his great students. Meanwhile, 57 other international students from Rosemount High, Westmount High, Laurier Macdonald High School and LaurenHill Academy enjoyed a sunny day out in the woods at Arbraska Rigaud. Coming from countries such as Germany, Korea, Brazil, Mexico, Italy, China, etc. for some of them this was their first time zip-lining. They all had lots of fun! Special thanks go out to Elizabeth Ambrosii and Ms. Bober from WHS and LHA respectively, for taking part in the trip and helping out as monitors. 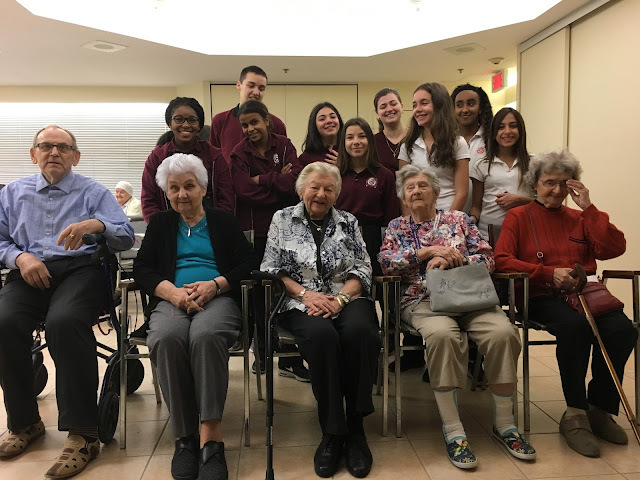 INTERGENERATIONAL PROGRAM: Rosemount High School recently launched an intergenerational program with three local nursing/retirement and senior centres in the East End of Montreal. The program, initiated by Spiritual and Community Animator Vince Lacroce, will include Almage Seniors Centre, Ukrainian Residence of Montreal “Villa” and CHSLD Dante. In all, over 30 RHS students will volunteer throughout the year. The aim of the program is to enhance awareness and appreciation of cultural heritage and traditions, to purposefully bring together people of different generations in ongoing, mutually beneficial exchange, and to learn from one another in a joyful and playful way. CBC BOOKS: CBC Books is launching a new creative writing challenge for students! The challenge: Students in Grades 7 to 9 and Grades 10 to 12 are invited to submit an original first page of an imaginary novel set in 2167, with the protagonist facing an issue that is topical today. The first page will set the scene for how the issue or trend plays out 150 years from now. Submissions open on Nov. 9 at 9 a.m. and close November 30 at 6 p.m. Submissions must include the first page (300 to 400 words) and the novel title. Prizes: Each category winner receives a one-year subscription to OwlCrate, a book subscription service, plus their school library receives 50 free Young Adult books. Bestselling YA writer Erin Bow, author of The Scorpion Rules will be the judge. Info: CBCbooks.ca, cbcbooks@cbc.ca and jane.van-koeverden@cbc.ca. 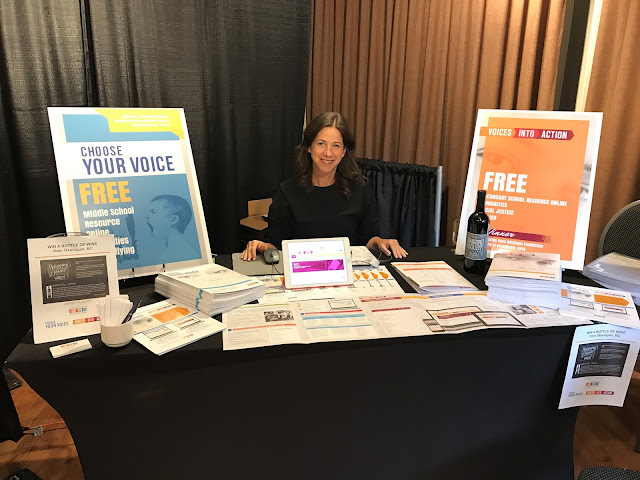 Wendy Singer (left) at our kiosk. KIDCON APPEARANCE: The EMSB and Inspirations Newspaper had a great time exhibiting at the third edition of KidCon Montreal at Stade Uniprix on October 21 and 22. Kids and parents alike had the time of their lives. There were activities for everyone, from arts and crafts to biking, skateboarding on a half-pipe, trying out new games, jumping on the trampolines, and of course, bouncy houses and slides. Cooking demonstrations, video gaming, and the reading area were also popular choices. Mimicking Comiccon, star-struck children waited their turn to hug their favourite characters and pose for photos with the likes of Paw Patrol, The Cat in The Hat, and superheroes galore. The EMSB and Inspirations had fun greeting proud EMSB students and their parents, and were delighted to meet families from other school boards as well. Representatives from Sinclair Laird Elementary School shared the table to promote their upcoming Open House. It was all smiles and fun at KidCon 2017! SPORTS CONCENTRATION: The new Sports Concentration Program at Gerald McShane Elementary School in Montreal North is in full swing. Here is a video we produced. SAVE THE DATE: On Friday, December 15, (10 am) Natalie and Adrian Bercovici from the Generations Foundation will film their annual Breakfast with Santa holiday spot at Gerald McShane. They will also be providing a present for each and every one of our students. The Rosemount High School Band has agreed to provide the entertainment and hopefully Santa might even make an appearance. For more information you can visit: The Art of Leadership. Register using promo code RR32 and save $50 per pass. For more information on seating and group arrangements please contact Rachel Ringler at 416-479-9701 ext. 332 or by email at rringler@theartof.com. NUTRITION HANGOUT: Royal Vale’s Grade 5 healthy eaters were the first students to participate in a Google hangout pilot study organized by EMSB dietician Pamela Yiptong. Following a class discussion on nutrition, the students of Nathalie Malhamé and Aaron Prosser had prepared and e-mailed some questions to Ms. Yiptong, who then set up the session for the students with her stagiaire. Across the screen, the students were able to discuss their questions with Ms. Anna and to gain a deeper understanding of different nutrition concepts in an interactive and engaging manner. While her stagiaire, spoke to the students from the office at the board, Ms. Yiptong monitored the discussion from the teachers' classes to ensure the session ran smoothly free of any technical glitches. GROWING HIS HAIR TO BENEFIT MS: For Oren Sendel, a Secondary I student at Royal Vale, his current look is much more 1980’s rock star than your average 12-year-old. After two years of growing his hair, he’s almost ready for a well-deserved haircut. After hearing a story about a child who grew his hair for the purpose of creating a wig for cancer patients, he decided to follow that example. Yet, Oren’s efforts serve two unique purposes. While his hair, which extends well beyond his shoulders, will be turned into a wig as well, his goal is also to raise awareness and funds for Multiple Sclerosis. With that in mind, Oren is calling upon friends and family for donations to the Montreal Neurological Hospital, in the care of the Multiple Sclerosis Clinic. His website is http://orensendel.weebly.com. “This is a disease that affects people in multiple ways. I have seen my mother struggle with this disease, which is why I want to help others like her,” said Oren. “The money can be used to pay for a taxi on a day when a patient is exhausted, or buy a cane for someone who needs one. It can also be used to offset the cost of the medicine need as they are very expensive. I trust that the hospital will know where the money is most needed.” Donations can be made at the following link. See this story on the subject. CHORALE NEWS: Here is a message from EMSB Chorale Conductor Patricia Abbott. Our annual Holiday Concert will take place Saturday, December 9 at 4 p.m. at Mountainside United Church. No tickets required for that one. There will be a collection for the Salvation Army’s campaign to help Montrealers in need. FAST PROGRAM: Many Ethics and Religious Culture (ERC) classes are utilizing material from FAST (Fighting Antisemitism Together). The privately funded non-profit offers online, bilingual, and completely free teaching resources for grades 5 to college. The action-packed resources present thought provoking media, videos, lessons and activities on historical oppression, discrimination and how to be a hero. Minority groups such as Jews, Muslims, Sikhs and the Indigenous are represented in the resources, giving students a wide range of perspectives and well-rounded education on human rights. The resources leaves students more knowledgeable about topics which are, at times, difficult to broach. Broaching difficult topics of the most heinous side of humanity moves young people to fight for what is right — to not be bystanders. Voices into Action, geared for grades 8 to 12, educates about prejudice and hatred in a profound, compelling way. A variety of media and artifacts explore the truth about the history of human suffering and social injustice which, as we know, is still a growing problem today. Students explore thought-provoking videos — first person accounts of: The Holocaust, residential schools, Islamophobia, immigration, Japanese internment camps, and so much more. Teachers can register for free www.chooseyourvoice.ca (grades 5-8) — www.voicesintoaction.ca (grades 8-11) ." Jodi Derkson on the job. http://www.blacktheatreworkshop.ca/nominate-a-young-artist/. Deadline for submissions by mail or email is October 31. LAUGHTER YOGA: Laughter is the best medicine and Science is behind this amazing life tool. As a Laughter Yoga leader and teacher trained by the founder of Laughter Yoga, Sylvie Dagenais-Douville is passionate about the concept of Laughter Yoga and the infinite reasons why it should be integrated in our school system. At a time where stress and anxiety are increasingly present in both teachers’ and students’ life, wellness through Laughter is an easy, fun and efficient solution. Laughter Yoga encourages children to physically play, engage socially and express themselves fully while away from their computer screens and iPhones. Studies demonstrate clearly that by increasing the net supply of oxygen to the body and brain, children stay focused for peak academic performance. Sylvie has been invited to present Laughter Yoga at conferences and workshop sessions across the country and internationally .Based in Montreal, she regularly offers Laughter Wellness conferences and workshops in Ottawa, Montreal and Québec City. From Community Centers to schools, work place and retirement homes, laughter touches everyone. She also uses the Laughter program as an amazing tool for Cancer survivors, their families and caregivers in Ottawa and Montreal. Recognized as Laughter Yoga Ambassador, she presented in Frankfurt Germany this past summer at the first International Global Laughter Yoga conference. CHABAD LIFELINE: Thanks in part to funding from its raffle, Chabad Lifeline has been able to assign a youth addiction counselor, Lindsay Faul, to be at Royal West Academy in Montreal West once a week to meet with students. Chabad Lifeline believes that education and early intervention in schools can bring down the number of addicts and help save lives. They have partnered with the EMSB and Royal West Academy to schedule weekly visits to the school by the Youth Addiction Counsellor. The funding for this new undertaking came in part from a recent raffle, which also supported the regular budget and maintenance of the Chabad Lifeline centre near the Jewish General Hospital. FACES BIDZ FOR KIDZ: Foster a Child to Excel in Society (F.A.C.E.S.) is announcing its third annual Bidz for Kidz fundraising event to raise money to support programs that promote essential life skills, job skills, tutoring, mentoring and mental wellness for at-risk youth. The event will be held on Friday, November 3 at the historic Forum de Montreal, former home of the Montreal Canadiens (2313 St. Catherine St. West) from 6 pm to 9 pm. F.A.C.E.S. is a non-profit organization devoted to helping at-risk youth and young adults develop the skills and knowledge they need to become autonomous and self-sufficient through educational, informative and hands-on programs. Get ready to play the night away with exciting casino games, a silent and live auction performed by a professional auctioneer, all while savoring delicious hors d’oeuvres. Tickets are $75 and can be purchased at http://www.fosterachildtoexcel.org/event. ENCOUNTERS WITH CANADA: There are still some places left for an exciting Encounters with Canada week in Ottawa (November 5 to 11) which lets students aged 14 to 17 explore the history of Canada at war with a $100 discount. • Participate in a very special ceremony to be held in partnership with Veterans Affairs Canada. • Experience a replica of a wartime meal with veterans. • Take part in various workshops such as the making of an Izzy doll, Remembrance slam poetry, etc. • Enjoy a walking tour of Ottawa to visit various war memorials and much more. See the attached flyer for additional details. Students register online at www.ewc-rdc.ca using your school's access code. (Please contact me if you don't have it.) As time is short, the signed registration form, along with a credit card number - for payment of $575 which covers transportation, lodging, meals, and activities - should be sent via fax or email, and must be received in Ottawa no later than Tuesday, October 31. Fax: 1-866-832-2459, attention Brianna/Email: btheoret@historicacanada. CAREER FAIR SUCCESS: Every year, St. Pius X Career Centre has the pleasure of hosting the EMSB Career Fair and also takes part in showcasing its own culinary and business programs. Many visitors are drawn to the Pius booths. This year was no exception, and many of those who visited signed up to be “Student for a Day” in the program of their choice. 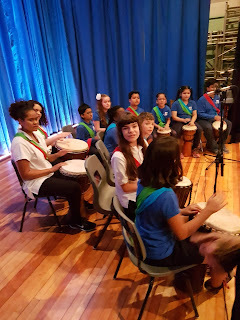 Both staff and students presented the diversified programs of Pius throughout the day and evening, and the students amazed their teachers with their professionalism and their eloquent communication. The culinary demos and the delicious treats that were offered at the culinary booth enticed many to return for second helpings! The culinary students, with the guidance of their chef instructors, prepared all the delicious meals that were offered over the two-day period to the exhibitors, volunteer students and many guests. As always, everything was scrumptious and very much appreciated by all. The Career Fair was a great success and Pius looks forward to hosting it again next year! NEW FACILITY TO OPEN: A formal opening for the new EMSB vocational centre in St. Léonard will take place on November 30. The beautiful facility houses programs in welding and auto mechanics. THANKSGIVING AT GALILEO: On October 5, Thanksgiving was celebrated at the Galileo. Adult Education Centre in Montreal North. 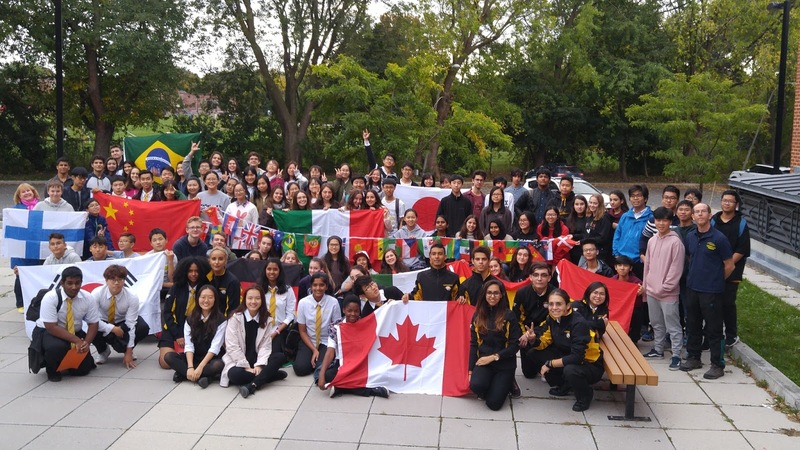 Galileo evening classes held their traditional potluck Thanksgiving festivities, after they were introduced to the Canadian Thanksgiving in class lessons during the course of the week. The Core Basic English classes (CCBE) shared their various cultures through a gastronomic affair. Homemade specialty dishes were introduced from Spain, Morocco, Syria, Iran, Bangladesh, Greece, Italy, Sierra Leone, Haiti, Libya and many other countries from around the world. Students preferred no music so that they could engage in meaningful conversation. They practiced their acquired English and French vocabulary with students from other classes and socially integrated through tasting delicacies prepared by students for this appreciative celebration. The true meaning of thanksgiving was enhanced by this special occasion. Enjoying a visit to Old Montreal. 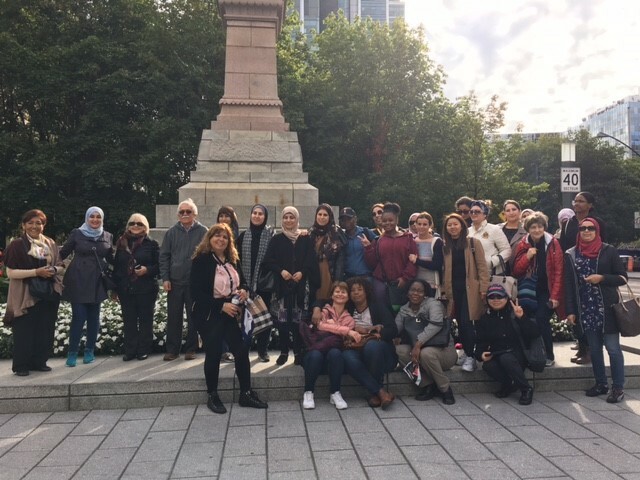 On October 6 Galileo CCBE classes enjoyed a walking tour of Old Montreal. Most students are newcomers to Montreal and part of the social integration component of learning a second language, is to assist students in learning how to navigate our wonderful city of Montreal. At the train station, students received a lesson on how to purchase train tickets, pay using an automatic teller and how to read a map to get from Montreal North to Old Montreal. Students were impressed with the architecture and the rich cultural heritage of Old Montreal as it was the first time that most students have had the opportunity to take in the history of our great city. Speaking a newly acquired language was put into practice as students walked and talked on their tour of Notre Dame Basilica, Place Jacques Cartier, Bonsecours Market and Montreal City Hall. A great day apple picking. 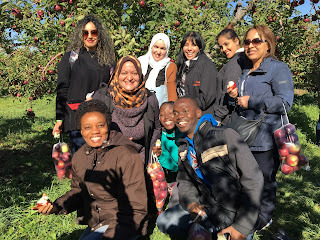 On October 12, Galileo students had a magical time picking apples. 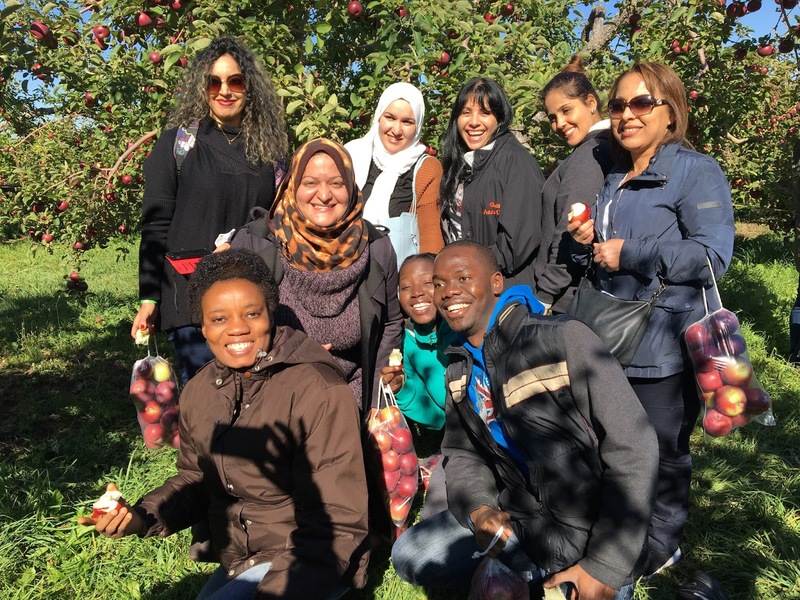 Students from the CCBE and SIS morning program collected apples while socializing with each other and engaging in meaningful conversations in the open fields of the apple farm. Students learned about the agricultural marvel of the fruits and squashes that were being harvested. Riding on the tractors and visiting the mini farm enhanced the experience for everyone. Enjoying a picnic lunch with fried zucchini and apple bread topped the day for students and teachers. That evening CCBE students went to visit the Montreal Botanical Gardens. They were mesmerized by the beautiful carefully designed and subtle lighting show of the Magic Lanterns at the Chinese Gardens. Students had the opportunity to visit the “The Great Pumpkin Ball” in the main exhibition Greenhouse.” There was a tasting of Chinese pastries and tea activity for all to enjoy. Most importantly students were able to acquire the vocabulary and specific terms related to gardening, Chinese deserts and tea. LE MOIS NATIONAL DES DIRECTRICES ET DIRECTEURS D’ÉCOLE: Les bonnes directions d’école administrent des écoles à leur image et peuvent avoir une profonde influence sur les élèves, les enseignants et l’ensemble de la communauté. Le Partenariat en Éducation est heureux de souligner de nouveau en octobre le dévouement des directrices et directeurs d’école, à l’occasion du mois national des directions d’école. Nous avons décrété l’an dernier qu’octobre serait le mois national des directrices et directeurs d’école pour souligner leur contribution vitale au sein des écoles publiques et des communautés au Canada et ainsi susciter une prise de conscience. Il vous est possible de soumettre une candidature dans le cadre du programme des directeurs et directrices exceptionnels du Canada, la seule récompense nationale et le seul programme de formation en leadership destinés aux directions d’école au Canada. En octobre, les directrices régionales de la CSEM ont tenu une petite réception avec les directions d’école afin de les remercier pour leur excellent travail. Pour en savoir davantage, visitez le http://www.thelearningpartnership.ca/news/october-is-national-principals-month. MESSAGES PUBLICITAIRES SUR CTV: La CSEM a dévoilé ses nouveaux messages publicitaires qui seront diffusés sur les ondes de CTV en octobre afin de promouvoir la saison des Portes ouvertes. Ces messages mettent en vedette la présidente de la CSEM, Angela Mancini, ainsi que six élèves. Pour voir ces messages, cliquez ici. PORTES OUVERTES: La CSEM a amélioré et mis à jour son site Web qui renferme l’information relative aux Portes ouvertes dans ses écoles (www.emsbopenhouses.com). Nous vous invitons à y jeter un coup d’œil. EMSB EXPRESS: Le numéro d’automne de la publication EMSB Express est disponible. Vous y trouverez à l’intérieur une section spéciale de 4 pages sur le nouveau programme de nutrition – Se nourrir, Grandir, S’épanouir – ainsi qu’un récapitulatif de la Soirée d’appréciation des bénévoles 2017 qui regorge de photos. Ce numéro de 20 pages est le plus volumineux à ce jour. Vous pouvez le lire en ligne ici. FOIRE DES CARRIÈRES: Plus de 2 000 élèves de 5e secondaire ont pris part à la 18e édition annuelle de la Foire des carrières de la CSEM le mercredi 18 octobre et le jeudi 19 octobre au Centre de carrières St. Pius X à Ahuntsic. Jack Dym de Pipe and Piling Supplies Ltd. et la Banque Royale RBC étaient les commanditaires en titre de cet événement. Plusieurs personnalités des médias étaient sur place pour renseigner les élèves sur les carrières dans ce domaine et ont agi à titre de maîtres de cérémonie : Eramelinda Boquer de CJAD, Catherine Verdon Diamond de Breakfast TV de City, les animateurs Vinny et Nikki de The Beat 92.5 FM, Sarah Leavitt de CBS, Tim Sargeant de Global News et Christine Long de CTV. La joueuse de basketball professionnelle canadienne, Lizanne Murphy, et la quadruple médaillée d’or de l’équipe féminine de hockey canadienne, Caroline Ouellette, ont rencontré les élèves. Elles font partie du programme olympique RBC où des athlètes olympiques et paralympiques canadiens agissent à titre d’ambassadeurs pour véhiculer des messages olympiques d’excellence et de leadership aux communautés du Canada. Mercredi en soirée, la Foire des carrières était ouverte au grand public. Ce fut une excellente occasion pour parents et élèves de se renseigner sur les options postsecondaires qui s’offrent à eux, grâce à ce guichet unique. Harriet Cohen des Services de l’éducation des adultes et de la formation professionnelle (SÉAFP) de la CSEM préside le comité de la Foire des carrières. Les Services aux élèves et les SÉAFP de la CSEM coordonnent ce programme. Mme Cohen souligne que l’objectif principal de la Foire des carrières vise à sensibiliser les élèves aux divers programmes d’enseignement qui s’offrent à eux. Tous les élèves ont assisté à une brève séance d’information générale dans l’auditorium du Centre de carrières St. Pius X. Ils ont ensuite pu visiter les divers kiosques d’information/d’exposition et s’entretenir avec des représentants des centres de formation professionnelle, des cégeps, universités et de certains collèges privés. Nous vous invitons à visionner le reportage de Breakfast TV à : https://vimeo.com/239004595. ÉVÉNEMENTS SPORTIFS ET INCIDENTS CARDIAQUES : À quel niveau de stress le cœur est-il soumis lorsque vous regardez un match de hockey? Une nouvelle étude publiée dans le Journal canadien de cardiologie révèle que la fréquence cardiaque des spectateurs de matchs de hockey en direct ou à la télé est considérablement élevée et se compare à la fréquence enregistrée lors d’un stress physique vigoureux. Les événements sportifs nous tiennent bien souvent en haleine, mais quel est l’effet d’une telle excitation sur notre cœur? L’extase de la victoire et l’agonie de la défaite peuvent avoir un effet mesurable sur le système cardiovasculaire. Munis de moniteurs Holter, une équipe de chercheurs a étudié les effets d’un match de hockey des Canadiens de Montréal sur des spectateurs en santé. Bien que des études antérieures aient démontré une corrélation entre les événements sportifs et les incidents cardiaques, il s’agit de la toute première étude à s’intéresser spécifiquement au hockey. La hausse moyenne de 75 % de la fréquence cardiaque observée chez les téléspectateurs et le bond fulgurant de 110 % enregistré chez ceux qui assistent en personne à un match sont comparables à la réponse cardiaque engendrée par un stress physique modéré ou vigoureux, respectivement. Globalement, la fréquence cardiaque a augmenté d’une médiane de 92 % (presque le double), tous spectateurs confondus. Les résultats de cette recherche et un éditorial sont publiés dans le Journal canadien de cardiologie, à http://www.onlinecjc.ca/. Cette étude a été conçue et réalisée par deux élèves du secondaire exceptionnellement motivées et curieuses de l’Académie Royal West. Il s’agit de Leia Khairy et Roxana Barin. UNE ÉCOLE TOUT EN MUSIQUE : Caroline Cameron, enseignante de musique à l’école primaire Pierre Elliott Trudeau, a travaillé avec ses élèves au projet « Une chanson à l’école » dans le cadre duquel les Sœurs Boulay ont composé la chanson « De la terre jusqu’au courant ». La vidéo de la prestation se trouve sur la page Facebook de l’école P.E. Trudeau et également sur la page Facebook de « Une chanson à l’école » (d’autres écoles ont aussi publié leur vidéo sur cette page). Plus de 600 écoles ont participé à ce projet, mais les Sœurs Boulay se sont rendues uniquement dans deux écoles pour y chanter avec les élèves, l’école P.E. Trudeau étant l’une d’elle. Nous vous invitons à visionner ce reportage diffusé à Radio-Canada qui met en vedette la belle prestation française de nos élèves : http://ici.radio-canada.ca/nouvelle/1058743/journees-culture-21e-edition-prestations-activites. La Presse+ a également publié un photoreportage ici. Cliquez sur ce lien pour voir les Sœurs Boulay chanter avec nos élèves. http://www.lafabriqueculturelle.tv/capsules/10175/les-soeurs-boulay-de-la-terre-jusqu-au-courant Madame Cameron collabore avec Michel Pagliaro, Élage Diouf et Crystal Shawanda. LE ROIS MIDAS: Au total, ce sont 230 élèves de la CSEM qui ont participé, le 26 octobre au Centre de congrès Palace à Laval, à ce projet fascinant qui relate la légende grecque du roi Midas. Cette initiative s’inscrit dans la foulée de la merveilleuse expérience de l’an dernier – Le temps des fleurs, le temps des neiges –, un projet multidisciplinaire d’envergure qui fut, lui aussi, couronné par la création d’un livre-CD pour enfants, en français. La CSEM fut représentée par neuf écoles primaires : Gardenview et Cedarcrest à Saint-Laurent, Pierre de Coubertin et Honoré Mercier à Saint-Léonard, Edinburgh à Montréal-Ouest, Roslyn à Westmount, Royal Vale et Willingdon à Notre-Dame-de-Grâce, ainsi que Sinclair Laird dans Parc-Extension. « Le personnel, les élèves et les parents se sont tous investis dans ce projet et je suis très fière que la majorité des choristes proviennent de notre commission scolaire », a déclaré la présidente de la CSEM Angela Mancini. SEMAINE ÉDUCATION MÉDIAS : La Semaine éducation médias 2017, qui se déroulera du 6 au 10 novembre (https://www.medialiteracyweek.ca), a pour thème cette année « L’inclusion dans un monde branché : Une place et une voix pour tous et toutes ». Dans cette optique, la CSEM mettra en valeur des méthodes pour permettre aux voix, perspectives et talents divers de prendre part à nos espaces médiatiques et numériques, et de les enrichir. Un certain nombre d’activités sont prévues, notamment le retour du journaliste Arpon Basu à son ancienne école primaire, Edinburgh située à Montréal-Ouest. M. Arpon est rédacteur en chef de The Athletic Montreal et Athlétique Montréal. Il a été à l’emploi de LNH.com pendant six ans à titre de directeur de rédaction et de collaborateur. Il a commencé à couvrir les sports à Montréal en l’an 2000, réservant une place très importante au hockey. Nadia Barrafato de l’école primaire East Hill à Rivière-des-Prairies lance un programme exhaustif sur la sensibilisation aux médias, la sécurité Internet et la cyberintimidation, pour les élèves de la 3e à la 6e années. En 5e année, les élèves étudieront ces thèmes, formeront des équipes et créeront une entreprise de « jeux vidéo » où ils devront concevoir un jeu sur la sécurité Internet et la cyberintimidation pour les élèves de la 3e année auquel ils pourront jouer en utilisant Scratch. En 6e année, les élèves apprendront ce que sont les médias et les différents types de médias. Ils examineront également une étude de cas portant sur la vie d’un élève dans les années 1950 et établiront des parallèles avec la vie des élèves en 2017. Ils découvriront le monde de la publicité et les techniques de persuasion utilisées par les agences de marketing. Plus tard au cours de l’année, ils créeront des publicités pour panneaux d’affichage et des couvertures de magazines, mettront sur pied des entreprises et inventeront des produits. Les autres enseignants qui se pencheront sur ce thème sont : Carolyn Liverman de l’école primaire Parkdale Elementary à Saint-Laurent, Jennifer Harriet de l’école FACE au centre-ville et Aaron Proeser de l’école primaire Royal Vale à NDG. ATELIER DE LITTÉRATIE GRATUIT: Lydia Lukidis, auteure publiée, a offert gratuitement un atelier de littératie aux élèves de 1re année de l’école primaire Dunrae Gardens le 29 septembre dernier. Les élèves ont eu droit à une lecture de la part de l’auteure ainsi qu’à un atelier de fabrication de marionnettes. Chacun a pu créer sa propre marionnette et se familiariser avec les rudiments de la manipulation et l’évolution des personnages. Cet atelier a eu lieu dans le cadre du festival « Les Journées de la culture », qui regroupe tous les ans des centaines d’activités culturelles gratuites. Pour en savoir davantage sur Lydia Lukidis, visitez : http://www.lydialukidis.com/. Pour de plus amples renseignements sur le festival, visitez : http://www.journeesdelaculture.qc.ca/. LA TOURNÉE DE LLOYD BARKER : Ex-joueur le plus utile de l’Impact de Montréal, joueur étoile de la ligue et ancien entraîneur-adjoint, Lloyd Barker visite des écoles à titre de conférencier motivateur. Ses exposés s’adressent aux élèves âgés de huit ans et plus. Ses présentations portent à la fois sur des thèmes de motivation (persévérance, appréciation, leçons de vie), sur l’importance de ne pas abandonner l’école, de même que sur l’entraînement et le bien-être. La durée de la présentation est de 60 à 75 minutes, suivie d’une séance d’autographes. Il suggère aux écoles de regrouper les groupes dans le gymnase pour la présentation. Il anime les présentations en matinée, de préférence. Il est à noter que la présentation de M. Baker s’apparente à celle qu’il a animée pour l’Impact de Montréal lorsque le club a procédé au lancement de son programme de persévérance scolaire en 2006. Il fut le principal conférencier pendant six ans. Ce programme a remporté un franc succès. Il offre ses services à titre gratuit. En retour, il demande simplement que l’école distribue aux élèves présents des dépliants de sa nouvelle académie de soccer. La carrière professionnelle de Lloyd a débuté dès l’âge de 17 ans lorsqu’il a signé son premier contrat professionnel avec l’Intrepid d’Ottawa de la Ligue canadienne de soccer (LCS). En plus de jouer pour l’équipe nationale de la Jamaïque, Lloyd a joué dix saisons avec l’Impact de Montréal. Depuis, il a été impliqué dans ce sport à tous les niveaux en Amérique du Nord et est aujourd’hui reconnu comme l’un des grands du soccer au Canada. Fort de sa longue carrière comme joueur, entraîneur et commentateur, il possède une vaste expertise peu commune au Canada. Pour en savoir davantage sur son académie, visitez le www.best11academy.com. Vous pouvez communiquer avec Lloyd par courrier électronique à lloydbarker11@yahoo.com. LA VOIX : Chelsea Goldwater, âgée de 12 ans et élève de 1re secondaire à l’Académie Royal West, a passé la première ronde des auditions à l’aveugle dans le cadre de l’émission La Voix junior diffusée à TVA. Elle a interprété la chanson Part of Your World et s’est adressée aux coachs et aux juges dans un français soigné. Chelsea a fait ses études primaires à l’école Royal Vale. SINCLAIR LAIRD A 60 ANS: L’école primaire Sinclair Laird dans Parc-Extension a invité les familles à faire un voyage dans le temps le 5 octobre à l’occasion de son 60e anniversaire. Cet événement a donné le coup d’envoi à 60 jours de festivités qui seront couronnés par la présentation du concert de Noël le 21 décembre, à 12 h 30. Les élèves actuels et des anciens, le personnel de l’école ainsi que les membres de la communauté étaient présents à cette occasion. Des exposés, des prestations musicales, des bandes audio et des expositions ont permis de se remémorer de beaux souvenirs. ÉLAN DE SOLIDARITÉ DEVANT LA TRAGÉDIE DE LAS VEGAS: À la suite de ce terrible acte de violence qui a fait 59 victimes, notamment 4 Canadiens, et a blessé grièvement des centaines de personnes à Las Vegas, les élèves et les membres du personnel de l’école secondaire Rosemont et de l’école primaire Nesbitt à Rosemont, ceux des écoles Perspectives I et II à Saint-Michel et ceux de l’école primaire Dalkeith à Anjou honoreront la mémoire des victimes avec la création d’un livre sous le signe de la paix et de l’empathie ayant pour titre Step Back. Move Forward. Sous la direction de Vince Lacroce, animateur de vie spirituelle et d’engagement communautaire, les élèves composeront des poèmes, rédigeront des messages personnels empreints d’espoir et créeront des représentations artistiques de paix dans la foulée de cette tragédie. Le livre sera relié et offert à l’hôtel de ville de Las Vegas en guise de solidarité et de soutien aux familles éprouvées. FÊTE DE BIENVENUE : Le 13 octobre, la CSEM a organisé une petite fête à l’intention des élèves internationaux pour leur souhaiter la bienvenue et leur permettre de faire connaissance. Vingt et un élèves internationaux du volet leadership de l’Académie internationale Marymount (quinze animateurs et six interprètes), accompagnés de leur enseignant Michael Bunn, avaient prévu pour cette occasion des jeux amusants pour faire bouger ces nouveaux venus et les inciter à échanger entre eux. Grâce à ces activités, nos 80 élèves internationaux ont été à même d’apprécier l’hospitalité de la CSEM. Ils en ont profité pour apprendre à se connaître et déguster tous ensemble un souper BBQ. Sincères remerciements à Anna-Maria Borsellino, directrice adjointe – Organisation scolaire, et aux responsables des élèves internationaux, CheonSeon Angela Kim et Elisa Medellin, pour avoir organisé un tel événement couronné de succès! Par ailleurs, 57 autres élèves internationaux des écoles secondaires Rosemont, Westmount, Laurier Macdonald et de l’Académie LaurenHill se sont amusés lors d’une belle journée ensoleillée au parc Arbraska de Rigaud. Pour certains de ces élèves provenant de l’Allemagne, de la Corée, du Brésil, du Mexique, de l’Italie, de la Chine et autre, il s’agissait d’une toute première expérience de tyrolienne. Ils ont tous eu beaucoup de plaisir! Sincères remerciements à Elizabeth Ambrosii et Marjorie Bober, éducatrices en service de garde à l’école secondaire Westmount et à l’Académie LaurenHill, respectivement, pour leur participation en tant que monitrices! Pour de plus amples renseignements, visitez : The Art of Leadership. Inscrivez-vous en utilisant le code promotionnel RR32 et économisez 50 $ le billet. Pour tout renseignement concernant l’attribution des sièges et les forfaits de groupes, veuillez vous adresser à Rachel Ringler au 416 479 9701, poste 332, ou par courriel à rringler@theartof.com. PARLONS NUTRITION: Les élèves de 5e secondaire de l’école Royal Vale ont été les tout premiers à participer à un projet pilote par l’entremise de l’application Hangouts de Google, organisé par Pamela Yiptong, diététiste à la CSEM. À la suite d’une discussion en classe portant sur la nutrition, les élèves de Nathalie Malhamé et Aaron Prosser ont préparé et acheminé par courriel une liste de questions à Mme Yiptong. Cette dernière a alors organisé une séance avec la stagiaire en nutrition et les élèves. À l’écran, les élèves ont pu discuter avec la stagiaire Anna pour ainsi mieux comprendre différents concepts liés à la nutrition, et ce, dans un contexte stimulant et interactif. Pendant que la stagiaire s’adressait aux élèves à distance, à partir de son bureau à la CSEM, Mme Yiptong surveillait la discussion dans les classes afin de veiller à ce que le tout se déroule sans accroc. SE LAISSER POUSSER LES CHEVEUX AU PROFIT DE LA SP: Oren Sendel, un élève de 1re secondaire à l’école Royal Vale de NDG, affiche un look qui s’apparente beaucoup plus à celui d’une vedette de rock des années 1980 que d’un jeune de 12 ans. Depuis deux ans qu’il se laisse allonger les cheveux, il se dit maintenant presque prêt pour une coupe bien méritée. Après avoir entendu l’histoire d’un enfant qui s’était laissé pousser les cheveux pour la fabrication d’une perruque destinée à un patient atteint du cancer, il a décidé d’en faire autant. Or, dans le cas d’Oren, ses efforts profiteront à deux causes. En plus de faire don de ses longs cheveux pour la confection d’une perruque, il souhaite aussi sensibiliser les gens à la sclérose en plaques et amasser des fonds pour combattre cette maladie. Ceci dit, Oren invite ses amis et les membres de sa famille à verser des dons à l’Hôpital neurologique de Montréal, au profit de la clinique de la sclérose en plaques. Voici l’adresse de son site Web : http://orensendel.weebly.com. « Cette maladie affecte les gens de diverses façons. J’ai vu ma mère combattre cette maladie et c’est pourquoi je souhaite aider les autres qui vivent la même chose qu’elle », a déclaré Oren. « Les fonds amassés pourraient défrayer le coût d’un taxi lorsqu’un patient est épuisé ou encore permettre l’achat d’une canne pour quelqu’un qui en a besoin. Cet argent pourrait également couvrir le coût des médicaments très dispendieux. Je suis confiant que l’hôpital utilisera ces fonds là où bon lui semble, pour répondre aux besoins les plus pressants. » Il est possible d’effectuer un don en visitant le site ici. 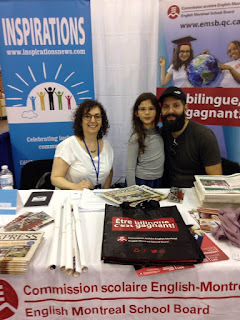 BROCHURE LEARN: LEARN est un organisme sans but lucratif œuvrant dans le domaine de l’éducation et dont la mission vise à desservir la communauté anglophone du Québec. Pour ce faire, LEARN propose un vaste éventail de services et de ressources, notamment des outils et du contenu d’enseignement conçus pour les niveaux primaire et secondaire; du perfectionnement professionnel; du soutien aux parents, aux écoles et à la communauté; de même qu’une gamme complète de services en ligne par l’entremise du campus virtuel LEARN. Ce campus renferme des cours en ligne pour les élèves des quatre coins de la province, de l’enseignement individuel, des cours d’été ainsi que des programmes adaptés qui sont élaborés de concert avec les écoles et les commissions scolaires. Tous les efforts déployés par LEARN visent la persévérance et la réussite scolaires au sein des communautés anglophones. Consultez la brochure sur notre site ici. http://www.blacktheatreworkshop.ca/nominate-a-young-artist. La date limite pour soumettre une candidature par la poste ou par courriel a été fixée au 31 octobre 2017. The next Focus will be published on November 23. Submissions should be made to Michael J. Cohen preferably by e-mail (mcohen@emsb.qc.ca) by November 17 at Noon.